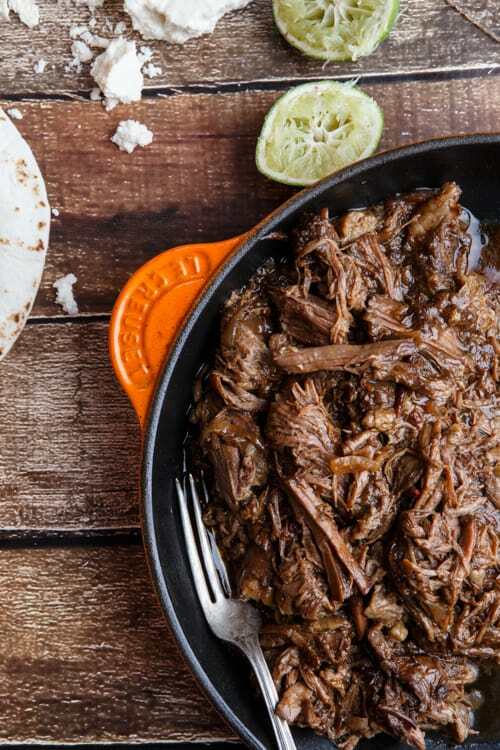 Create a super easy, budget-friendly meal with this Slow Cooker Chipotle Root Beer Beef Barbacoa. Customize your family dinner with tacos, quesadillas, and more! You’ve got a bottle of root beer. A chuck roast. Some chipotle peppers, an onion, and a handful of spices. Oh, and a slow cooker. Can’t forget about the slow cooker. What do you do? Get all MacGyver on these ingredients and create an instant Mexican feast. P.S. I love MacGyver. I have all seven series on DVD . I remember being a kid and thinking MacGyver was pretty much the coolest person ever (still kinda do). And Murdock still creeps me out. Okay, sorry. Back to food. So this chipotle root beer beef barbacoa. 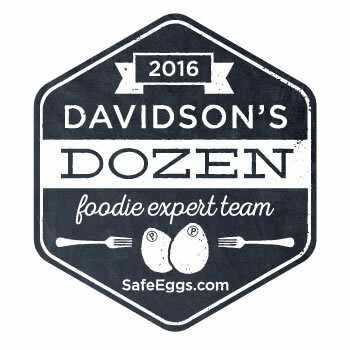 It’s literally like a ridiculously easy, takes two seconds of prep kind of meal. And those meals rock. And after you slave away all day in the kitchen (also known as throwing a few ingredients in a slow cooker and walking away for 6 to 8 hours), you get to dig in. And digging in is completely customizable. You want tacos? Just grab some tortillas, mix up a quick pico de gallo, maybe some guacamole, and some queso fresco, cilantro, and lime wedges. Quesadillas more your style? 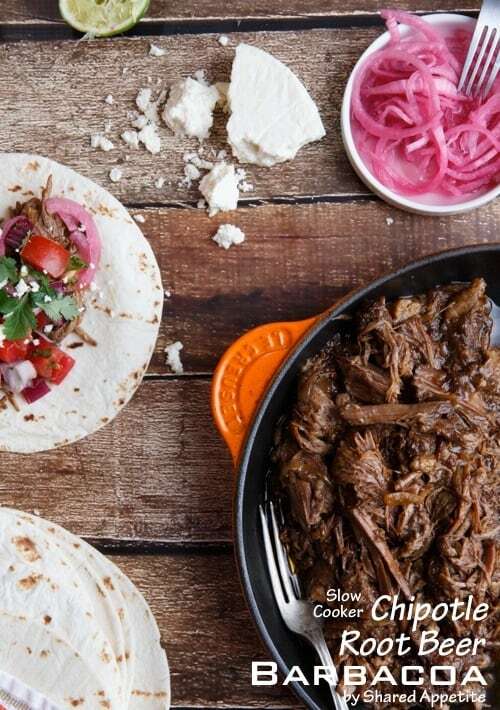 That’s how I was rolling this time around with this sweet and spicy slow cooker beef barbacoa. 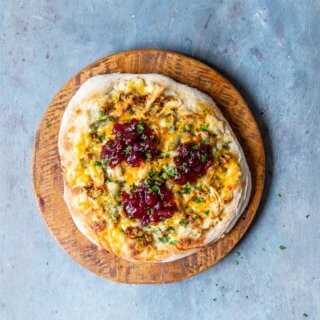 Just throw some of it along with a healthy dose of cheddar and/or jack cheese and cook ’em up in a skillet or in the oven. Oh, and I almost forgot my favorite part. 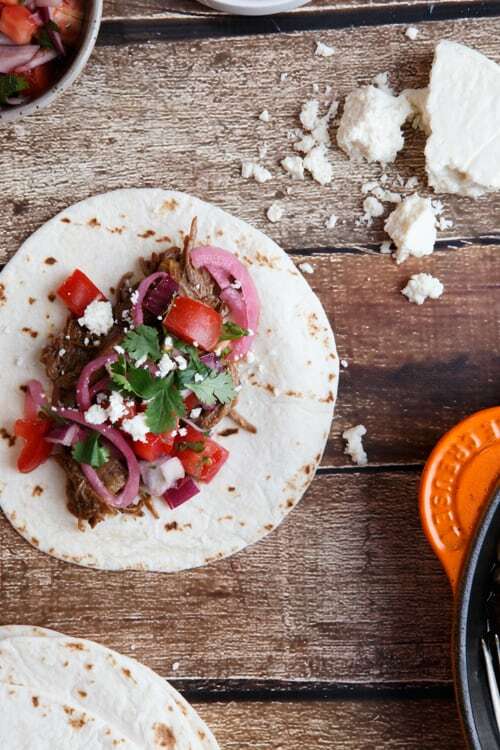 You need to make some easy pickled onions for this chipotle root beer barbacoa. It’s SO good with it. Place sliced red onion on bottom of slow cooker. Generously season roast with Kosher salt and freshly ground pepper and place on top of onion in slow cooker. Finely chop chipotle peppers and add to slow cooker, along with adobo sauce, root beer, brown sugar, garlic powder, and paprika. Cook on low for approximatley hours, until meat is very tender and falling apart. Remove meat to a bowl and shred using two forks. Remove any excess fat. Create a slurry by stirring cornstarch in water until dissolved. Pour into slow cooker and stir to incorporate. Return shredded beef to slow cooker and cook for an additional 1 hour to allow flavors to meld. If the sauce is still too thin, remove meat and onions and pour liquid into a small saucepan. Bring to a simmer over medium-low heat and allow to reduce to desired consistency. I did this to concentrate the flavor of the sauce a bit and to allow it to thicken to a glaze like consistency. Combine sauce with shredded beef. 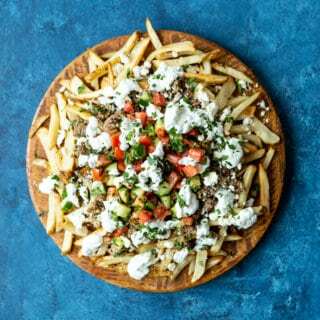 Serve with all the fixings for tacos, or make quesadillas with shredded cheddar and monterey jack cheese and pickled onions. I just found your blog. This looks amazing, I am going to buy everything tonight for dinner tomorrow. Love looking at all your recipes. Your photos are great! Great! Let me know how it turns out. Whatcha making… tacos? nachos? quesadillas?! Slow cookers are a life saver during those busy weeknights, aren’t they? !